NIA CHARLESTOWN NEVIS (July 01, 2016) — Minister of Agriculture Hon. Alexis Jeffers expressed gratitude to the government and people of the Republic of China (Taiwan), for their continued beneficial support, spanning more than 30 years, to Nevis and the Federation of St. Kitts and Nevis. 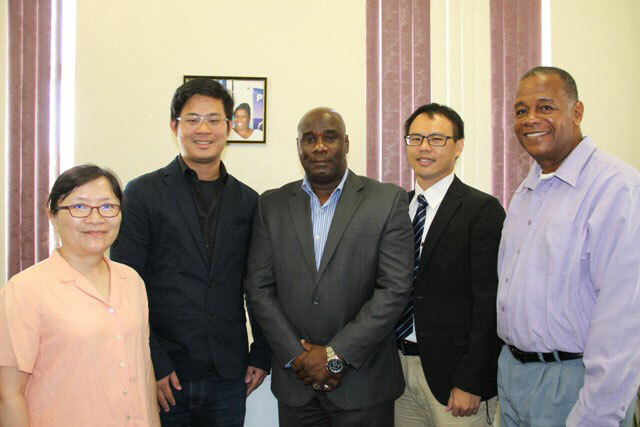 Mr. Jeffers made the comment when a team from the Taiwan Mission in St. Kitts, headed by Shih-Lung Cheng Project Manager of the Vegetable, Fruit and Upland Crop Quality and Safety Improvement Project of the International Cooperation and Development Fund, visited him on June 29, 2016, at the Nevis Island Administration (NIA) building in Charlestown. He was accompanied by Yu-Wen Lin, Associate Researcher at the Soil Analysis Laboratory, Agricultural Chemistry Division at the Taiwan Agricultural Research Institute and Shih-Yu Chang of Eco Garden in Taiwan who were on Nevis to conduct training sessions over two days with farmers. “We are delighted that over those years, we have indeed seen an improvement in many areas of the Federation of St. Kitts and Nevis but as we are in Nevis, let me say in agriculture, tourism and also in education, we have had some tremendous benefits derived from this relationship and we expect that to continue to grow,” the minister said. Mr. Jeffers told the team he was pleased they had come to Nevis to improve agriculture on the island. He noted that the Taiwanese experts training to farmers is consistent with the Department of Agriculture’s thrust, to improve and increase farmers’ capacity to take on new techniques and introduce new technologies that would ensure continued growth and sustainability of agriculture. He explained that the Department of Agriculture continues to place emphasis on training because it is only through training that one could garner the necessary skills and techniques needed to ensure that agriculture remains alive and well in Nevis. Mr. Jeffers hinted at future training sessions for farmers on the various linkages that could be forged. “All this is being done to ensure there is a linkage between training and the ultimate result of producing better and healthier crops. “So that is what our emphasis would be moving forward to ensure that we are able to provide healthy products for our people here on the island of Nevis,” he said. In brief remarks, Shi-Lung Cheng said they were pleased to be able to provide the training to farmers on Nevis. He expressed appreciation for the opportunity afforded them by the NIA, a partnership which facilitates continued training for farmers on the island. Also present was Permanent Secretary in the Ministry of Agriculture Eric Evelyn.